RSAC Advisory: Contains wanton and gratuitous violence. Rise of the Triad is a First-Person Shooter released by Apogee Software in 1994. There's a story, involving a United Nations special operations team sent to investigate suspicious cult activity on a remote island, but you wouldn't know it unless you read the manual. Like most early FPS's, it's all about shooting anything that moves and picking up anything that doesn't. Rise of the Triad introduced a number of gameplay innovations, many of which have become common in the FPS genre: elevated platforms, jumping, sneaky enemies that play dead and steal your weapons, areas full of poison gas, a plethora of different missile weapons, adjustable violence levels with a password lockout, breakable windows, bullet damage to walls, selectable player characters with varying abilities, and extensive multi-player support. In an era where "online gaming" meant two people playing head-to-head over a direct modem link, Rise of the Triad offered 11-way multi-player games over a local area network (a dedicated server is required for more than eight players). The game supports a number of multi-player variants, including basic deathmatch, several variations of "tag", a race to collect the most treasure in the least amount of time, and "Capture the Triad": the first implementation of Capture the Flag in a first person shooter. Each mode offered a number of tunable options to further customize gameplay. The game didn't support this newfangled Internet thing, just Novell NetWare, so the only way most people could enjoy an 11-player fragfest was to take over an office or academic computer lab after hours. The adjustable violence setting allows the player to select from four levels of gore: the self-explanatory None, small spurts of blood on Some, big damage causing enemies to turn into a little pile of mush on A Lot, and the default setting of Excessive, which can occasionally result in Ludicrous Gibs. An "engine killing gibs" cheat existed that, when enabled, would caused exploded enemies to spew hundreds of pounds of gibs that would fly across the room. Interestingly, the shareware and "registered" (full retail) releases of the game have no single-player levels in common (the retail version did include the multi-player levels from the shareware version). Apogee sold three different versions of the game: a basic floppy-disk version, a CD version that included additional levels and other bonus material, and a Site License CD version. The Site License version allowed for installation on up to 11 computers and included multi-player levels designed for big games, a signed license certificate "suitable for framing", and 11 individual license cards. Apogee also sold a bonus pack that added some of the CD bonus content to the floppy-disk version of the game. The full version of Rise of the Triad supports user-made levels. Additionally, the bonus pack includes the RANDROTT random level generator which can generate a set of up to 100 levels for either single-player or multi-player. Unfortunately for Apogee, Rise of the Triad hit the streets two weeks after id Software (who once used Apogee as a publisher) rewrote the PC gaming rulebook with the release of Doom. Rise of the Triad was based on an evolution of the Wolfenstein 3D game engine and, like its progenitor, only supported walls laid out on a square grid at 90-degree angles to each other. Although staircases and bridges could be built using floating platforms (and players could go both under and over a bridge, which you could not do in Doom), the floor and ceiling heights throughout each level were fixed. Jumping was only possible through the use of fixed jump-pads. Next to Doom, which featured walls at any angle, variable floor and ceiling heights, and ambient lighting effects, Rise of the Triad looked dated. However, despite being graphically behind the times, it was still a damn fun game. Apogee/3D Realms have since released the source code to the game and there is at least one enhanced Win32 port of the game available. You will need the original data files (which remain copyrighted) to play it though (the data files for the shareware version are still available for free). Altum Videtur: El Oscuro in the original spat out angry, nonsensical Latin at you ("eat your veggies", among them). Attackable Pickup: The Priest Porridge, which can be turned into a more effective Priest Porridge Hot with a carefully aimed explosion. Batter Up: The magical Excalibat weapon. Bilingual Bonus: The stuff El Oscuro says when you fight him is actual Latin; phrases include "Deus tuus sum" ("I am your god") and "Mundus tuus morietur" ("Your world will die"). A sound clip that was cut from the game (you can find it on the game CD or the downloadable Rise of the Triad Goodies Pack), intended to have been played when Snake Oscuro sees you, apparently translates to "Eat Your Veggies". Bloody Hilarious: Even the violence isn't taken very seriously: look closely when you blow up an enemy soldier, and you can see his severed hand fly by wagging its middle finger at you. Also, the smiley face on the charred skeletons of baddies toasted by the Flamewall weapon. Cool Chair: Sebastian Krist. His chair shoots rockets. Mines, as well, since you can't forget those annoyances. Die, Chair, Die! : Rise of the Triad is quite possibly the first First-Person Shooter to have environmental objects that could be destroyed. One of the end-of-level bonuses is for destroying all the plants on a level. May be also applied to the thing Krist is riding on. Dual Boss: The level "Krist Cross" in Extreme Rise of the Triad makes you fight two Krists at once. Although you only need to defeat one to finish the level, and this applies to any other custom level with multiple bosses. NME Mine from the same add-on takes it Up To Eleven, making you fight against four NMiEs. Just try to dodge all the stuff that flies at you. Expansion Pack: Extreme Rise of the Triad, with 42 new Nintendo Hard levels exploiting various engine tricks to add new features like teleporters and "Ballistitowers". The EKG (Engine Killing Gibs) mode, which cranks the gore Up to Eleven. Also NME. Pronounce it out loud. A sort of reverse of this trope, look at Ian Paul Freely (one of the playable characters), and think about his name for a minute. God Mode: Lampshaded. Accessible through an in-game powerup as well as the usual cheat code, God Mode doesn't just make you invincible, it also makes you ten feet tall and capable of firing blasts of energy from your bare hands that can disintegrate everything in the room with your character making godlike bellowing noises all the while. There's also a Dog Mode that makes you invincible, two feet tall, and capable of firing a deadly supersonic bark. Goomba Stomp: You can kill any non-boss character this way, including other players. Guns Akimbo: Or, as they say, John Woo style. Holiday Mode: For Christmas, has a notable 'portrayal', with awesome music replacement. Well, awesome as usual, actually. Idiosyncratic Difficulty Levels: There are three lists of four names used by the game (only one of which is present in the shareware version) and which list is used is randomly selected every time the difficulty selection screen shows up. Jump Physics: You literally walk in the air. Ludicrous Gibs: Rise of the Triad is the Trope Namer for this one. Macross Missile Massacre: The Drunk Missile weapon fires five missiles at once which have heat-seeking capabilities. The results in a room full of bad guys can be quite messy. Malevolent Architecture: Count how many kinds of booby traps there are in Rise of the Triad. Pushwalls, flaming pushwalls, shrooms in a jar, boulders, lava pits, shredders, up-'n-down shredders, ceiling shredders, flamethrowers, floor flamethrowers... Must be enough to become that everything that is trying to kill you. The Many Deaths of You: Pretty rare example for a first-person shooter game... With the most cheesy sound ever, YUUUU SUUUKKKK! included. Nintendo Hard: 84% of all levels in the original Rise of the Triad and 98% in Extreme Rise of the Triad. See Self-Imposed Challenge entry below also. Ninja Pirate Zombie Robot: Fireball-shooting zombie death cultist monks that speak in Ominous Latin Chanting and a robot boss that engages in Macross Missile Massacres. 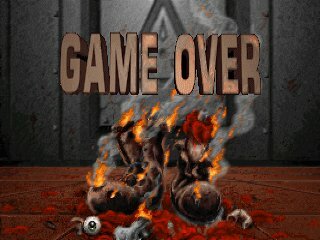 Nonstandard Game Over: If you fail to destroy all the larvae in the final level before killing the boss, you'll get an alternate ending where the world is destroyed, and you're required to start the level over again. In addition, when a boss dies, he blows up (justified because bullet weapons and melee attacks don't do anything... you have to use missiles, magic or some combination of the two). If you happen to die in the explosion, you get a Game Over. Even with maxed out lives (this guy had 63). Overdrawn At the Blood Bank: Engine Killing Gibs mode causes enemies killed with missiles to spew gallons of blood in all directions. Punny Name: "Taradino Cassat", for Spanish speakers, if you consider that tarado is a slang word for idiot and even retard. Ian Paul Freeley hangs his own Lampshade in the ending wherein he complains about how he saved the damn world, but people only care about making fun of his name. Making Freeley's situation even worse, according to the manual he wrote a novel called The Yellow River. Refuge in Audacity: The storyline and setting make no sense, but it's too cool for you to care, and the fact that the RSAC rating system considered it more violent than Doom was one of its selling points. Rocket Jump: The Trope Maker. The first game that allowed you both to look up and down and fire a rocket that won't instantly destroy you utterly. Self-Imposed Challenge: There's one, which makes the entire game Nintendo Bloody Impsossible (think of I Wanna Be the Guy) instead of just Nintendo Hard. All you need to do is:     The basic purpose of this challenge is to polish your missile-dodging skills SO throughout you wouldn't even imagine. The catch is: every Lightning Guard wields one of the many lootable rocket launchers (or, considering there's no sprites of them carrying a RL, rocket pistols). Should only you be unstrafeful for a split of a second, you'll be thrown back to the drawing board. Considering Low Guards and Lighting Guards tend to change between each other randomly, the challenge will become purely luck-based. Have fun dying! Shareware: The original game has this and the commercial, full version. The shareware has different levels from the full game. Its title is Rise of the Triad: The HUNT Begins and the full version is named Rise of the Triad: The Dark War. Shout-Out: Krist's full name is Sebastian Doyle Krist, and one of the music tracks is titled "Run Like Smeg". Similarly, entering the console command "Nodnol" would cause the level to go foggy. A couple Dopefish also show up. Standard FPS Guns: Subverted. You've got your pistol and machine gun, but from there the game offers several rocket launchers with different functions, a magical baseball bat, a literal God Mode, and an alternate Dog Mode. Tennis Boss: ...No. Tennis Player. Let's face it: you had a lot of trouble while dodging your own projectiles that Snake Oscuro mirrors? Twenty Minutes Into the Future: According to the game's opening, it takes place "one year in the future." The Walls Are Closing In: In early versions, even touching an approaching wall causes instant death. While walls usually were independent movers, there are some places where sections of walls move back and forth to crush the player and one level where it appears the walls are closing in when you hit a touchplate but stop at the last second. What Do You Mean It's Not Awesome? : Naturally. ↑ Look for config.rot file and set the Super Hard option to 1. ↑ Open Win ROTT itself and set 'TIMELIMIT 36000; MAXTIMELIMIT 36000; WARP (fully optional) [number of level you wish to play]' in the command line, without quotes. Time limit gives you a possibility to have infinite lives during those 10 hours of play. ↑ Select the hardest difficulty. Never use savegames. This page was last edited on 19 September 2018, at 12:00.